UPDATE: I have been informed via multiple sources that Dr. Akin has decided to rescind this decision to cap the Instructional Assistant’s and Special Education Aides salaries at $11.00 per hour. The current contracts for staffing services will be extended for one year allowing the district more time to evaluate their needs. This is fantastic news, and I greatly appreciate the work of the Board Members who worked on this today and the wisdom Dr. Akin has demonstrated here. This level of responsiveness is not something our district is used to, but I greatly appreciate it. Dr. Akin, you have my gratitude for this. The easiest way for us to avoid something like this in the future would be for us to end the outsourcing of our staffing needs. As it is cheaper and better for us to staff our schools on our own, I would like to see us move in that direction and away from paying companies like Appleton an additional 29.5% to staff our schools. Let’s pay that amount to our aides and secretaries directly. This will only take you a few minutes to complete. Again, Dr. Akin, thank you for listening to the people of Huntsville on this matter. I appreciate it. I honestly thought I was done with this, but it seems that Dr. Akin has decided to follow in his predecessor’s footsteps by balancing his exorbitant salary (about the fifth highest in the state), not to mention doubling the Deputy Superintendent’s salary by hiring two people to replace Dr. Cooper when she left to move to the State Department of Education in November, on the backs of our neediest kids. Could you survive a 27% cut in your salary? How happy would you be if your employer was actively working to hide the fact that your salary was going to be cut by 27% until a few days before you were scheduled to report to work? Welcome to Huntsville City Schools where the more things change, the more they stay the same. These rumors, like so many before that involved our kids, have proven to be completely true. Special Education Instructional Assistants (SPED Aides) are the people who typically work directly with the SPED kids either in a resource room or helping them to manage in a general education classroom setting. They are the lifeblood of allowing a special needs kid to be able to attend public schools. They make it possible for a teacher to teach. Without aides, we would need to return to the days when special needs kids were simply kept at home all the time. These SPED Aides are regularly asked to endure getting scratched, bit, hit, and kicked. They are asked to chase down a child whose instincts tell them that running into a river would be fun. They feed our kids, dress our kids, diaper our kids, and most of all love our kids because despite the hard times, SPED kids are, without compare, some of the kindest, gentlest, most loving kids on the planet. Matthew has been extraordinarily blessed by the aides who have worked with him in the past. Some of them have been working as aides in Huntsville City Schools for decades. They have seen our kids grow up. And most importantly, they know from individualized experience with our kids exactly how to get the absolute best out of each of them. In short, these kind women and men are the reason that I haven’t had to worry about my son’s well-being. And now Dr. Akin is trying to hurt them and their families. 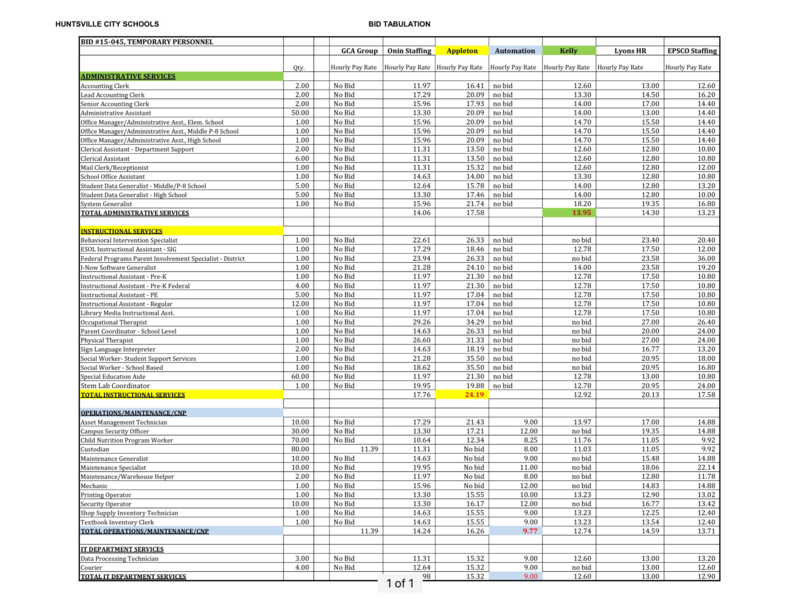 Here’s a copy of the Bid Tabulation from 2015. Please keep in mind that these figures are not the amounts that the district pays to the aides. This is the amount that the district pays to Appleton, who then takes a cut of 29.5% from that amount to manage the staff they provide to HCS to work with the kids. As I’ve pointed out before, privatizing our staffing needs costs significantly (about 20%) more money than hiring our own aides even if you include the cost of the benefits in that cost. Here’s the evidence if you don’t wish to take my word for it. It is far past time that we insist that the district stop farming out our staffing needs. The district has a well-staffed Human Resources department. They are absolutely capable of hiring our aides. They’ve done it before. There is no reason why we shouldn’t be hiring our aides ourselves. Hiring our own aides would save us money. And it would allow us to avoid these types of problems in the future. 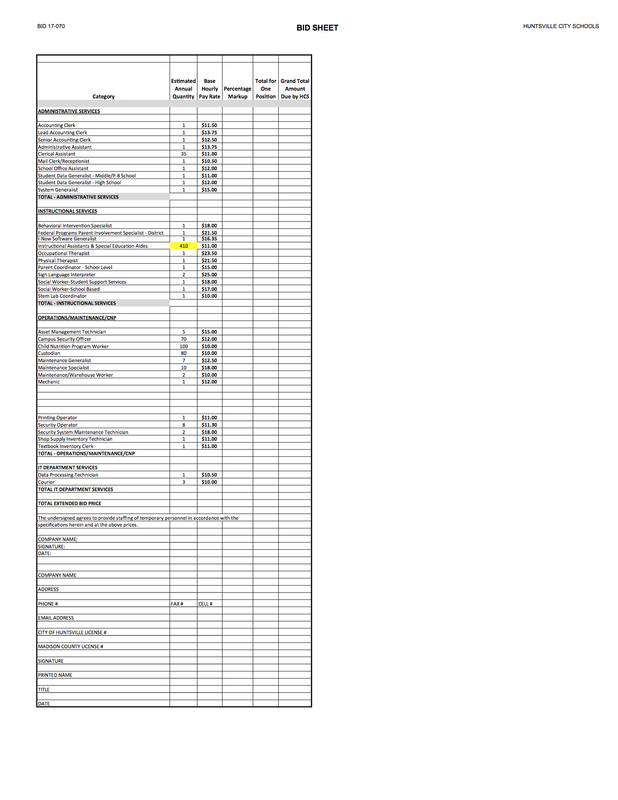 So as you can see in 2015, there were basically two rates of pay for Instructional Assistants: $21.30 for SPED Aides (who are required to receive significant training on how to interact with SPED kids) and PreK Aides (who have to have a college degree to get the job) and $17.04 for Regular and PE Aides. When you subtract Appleton’s cut of 29.5% from those amounts you get an hourly salary for SPED Aides and PreK Aides of $15.00 and for Regular and PE Aides of $12.00. As you can see from the Requests for Proposal below, Huntsville City Schools has requested that all bids combine all Instructional Aides into just one category. (This is why they are looking to hire 410 of them. This past year there were about 210 SPED Aides). And as you can also see, the Requests for Proposal bid sheet caps the Base Hourly Pay Rate at $11.00 per hour for all four types of aides. Thus, Huntsville City Schools, under the leadership of the new superintendent Dr. Akin, whose own salary is one of the highest in the state, is insisting upon cutting the salaries of the people who make education possible. It has been rumored that one justification the district is offering for this change is that they wish to be “fair” in how they pay their aides. Evidently Dr. Akin believes that everyone should be paid exactly the same regardless of their duties or the educational requirements their position requires. So his proposed solution is to cut everyone’s salary. If you assume that Appleton will continue to take a 29.5% cut for their hard work of providing staff to HCS, and you compare that rate to the 2015 Bid Tab, you’ll find that with the exception of the Federal Programs Parent Involvement Specialist (a district level employee) and two Sign Language Interpreters (who were making so little under the 2015 bid that Appleton likely struggled to keep the positions filled), every single Instructional Services position will be cut in the 2017 Bid process. Each of these positions will receive salary cuts starting this school year if Dr. Akin is allowed to do this. Just like Dr. Wardynski before him, Dr. Akin seems intent upon balancing the books of the district on the backs of our kids. He seems particularly intent on doing so by cutting the services offered to our Special Education kids. At the end of the school year, the district had three Autism Specialists. These Autism Specialists are former SPED teachers who have been specifically trained in working with and teaching our teachers and aides techniques to work with kids on the Autism Spectrum. 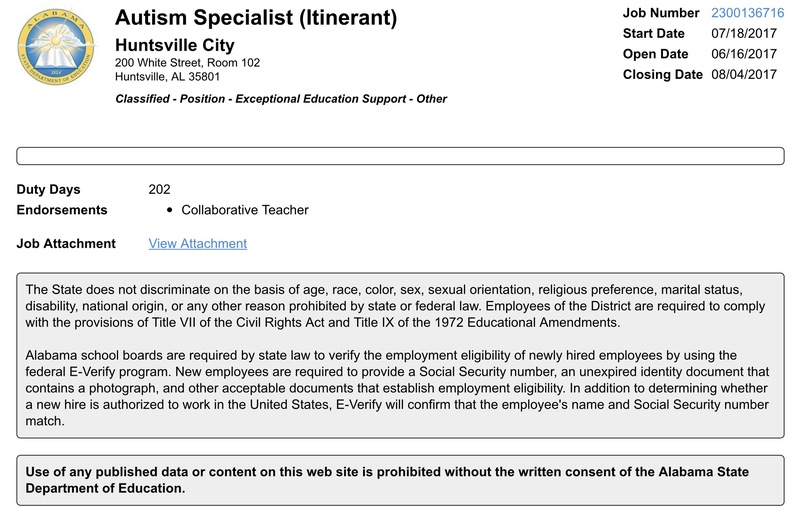 If this seems like a lot of specialists, please remember that Autism is the most common exceptionality in our district. Three Autism Specialists is not enough. So what did Huntsville City do at the end of the school year? Well, they approached two of those three specialists and offered them the “opportunity” to take a cut in salary and return to the classroom. I did not know the two specialists who received this offer, but their reputations were exemplary. As staffing issues are complex, I typically do not write about them. This is why I didn’t write about this decision earlier in the summer. I was informed that the district would replace these two specialists with two more. The main problem with this announcement is that pesky closing date in the upper right hand corner. This position will close two days after the start of school. This means if this posting goes extremely well, the district will receive applications from people looking for positions two days after the start of school. The interview process will likely take about a month to complete. Assuming that they have one or hopefully two candidates worth hiring, these two specialists might start their jobs by the end of the first nine weeks. And this is if everything goes perfectly. August 4th, isn’t July. In case you couldn’t put that together. Need one more data point that the more things change, the more they remain the same for SPED kids? During the last week of school, the district started meeting with parents to tell them, once again, that their kid would be attending a completely different school next year (often the only school their child has ever attended). Of all the kids in the district, SPED kids are the ones most in need of stability. And yet, inevitably, they’re the ones being moved and transferred the most. I apologize for the length of this post. I haven’t been writing much lately because I wanted to give Dr. Akin a chance to show us where he would take the district. Unfortunately, it seems that he’s following in Dr. Wardynski’s footsteps in regards to his handling of SPED issues. And as I pointed out to anyone who would listen in 2011 and 2012 when much of the city was just in love with Dr. Wardynski, how a superintendent works for and addresses the needs of our neediest students shows his true character. Dr. Wardynski hated our SPED kids and saw them as nothing but a source of funding that he could cut and use elsewhere. I cannot tell you how heartbroken I am to have to write that it seems that Dr. Akin is doing exactly the same thing. This time, however, there’s still time to stop it. If the district’s finances are in such dire straits that we need to cut people’s salaries right before school starts (and right after we just doubled what we’re paying for a deputy superintendent), it’s past time that Dr. Akin made this clear to the community. And if that’s not the situation, Dr. Akin, then please, stop cutting the salaries of the people who work directly with our kids. That is not the right place to make cuts. Disheartening to say the least, but not terribly surprising to me. I have so little confidence in our school board’s ability to make a RIGHT decision, that I really didn’t expect this superintendent to be anything other than a disappointment. Did any of the board even inquire about Akin’s approach to SPED when he was being vetted? I don’t think so. Of course the man doesn’t see it as a district priority. Right now the system is so focused on federal oversight on matters of race that they can’t attend to anything else. And of course he wanted a second Deputy — he’s never supervised this many employees or been responsible for anywhere near this large a student population! A lot of them already have a second job, even at current salaries. Thank you Mr. Winn for writing this article. I used to work at Challenger last year (Kids K-1st SPED). I have met you before ( you used to bring bagels on Fridays). I never thought that anyone cared about any of us (Appleton Aides). Thank you for caring enough about us to say something. It is financially difficult to be an SPED aide. Me and my husband both work for Appleton. It is true, we love these kids and we would do anything for them. You’re the one deserving of my and our thanks. Thank you. Thank you so much for speaking out for us. I too am a contractor with HCS, as are the computer people, the office clerks, the janitors, and mantience staff. Like you, I can’t understand why the district would choose to pay extra for outsourcing that hurts everyone but the middlemen. I can tell you from experience that the “managing” these companies do is extremely minimal. We are HCS employees in all but name. We fear speaking up because, as you correctly point out, we have no job security what so ever. All we want is to be treated fairly and with respect. We deserve the same privileges as anyone else who goes to work in an a Huntsville City School everyday.